Mountaineer was one of 100 locomotives built by American Locomotive Company (Alco) at their Cooke works in 1916 (works number 57156) for the British War Department Light Railways (WDLR). It worked as number 1265 in France during the First World War. Little is known of the engine’s early history but it moved to the Ffestiniog Railway on 2nd Nov 1967, where she was steamed and entered service the following weekend. She has been rebuilt several times into a reliable locomotive with oil firing (1972), superheating and piston valves, and fitted with the new SB3 boiler in 1983. February 2006 saw her last weekend in service on the FR and she is now stored, waiting the money and time to overhaul her back to her former glory. The loco is named after one of the original England engines and the nameplates are replicas of the originals. The bell from the original Mountaineer also survives and is fitted on special occasions. 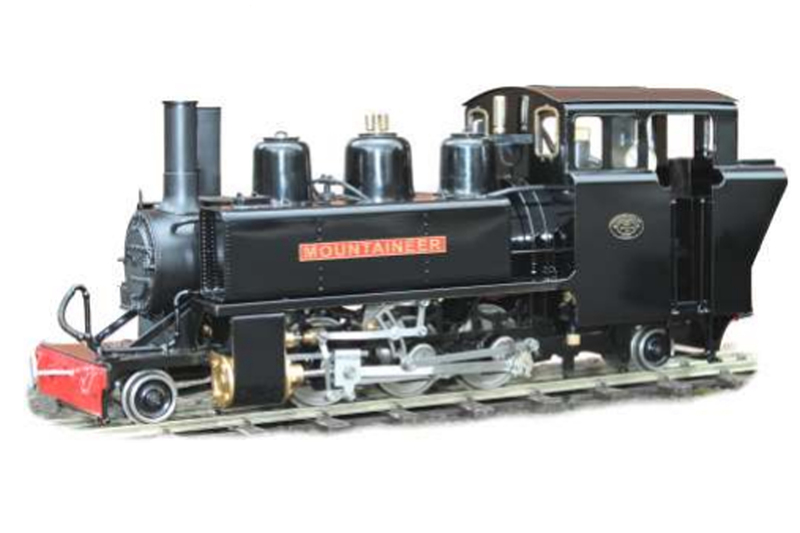 Our model depicts her as running just prior to removal from service in 2006. Dimensions (loading gauge) are, Length 370mm over buffers, Width 110mm, Height 145mm. Weight 3.9 Kg. (with Radio Control fitted). Available in any standard ROUNDHOUSE colour but also in the grey WD livery with white markings and number.